Loving God our Father totally without reservation adds nothing to Him or His Glory. He commands it for our benefit alone and because He truly loves us so much. How can we truly love Him with all our heart, soul and strength? When we will not spend time in prayer? When we will not listen to His Word daily? When we allow ourselves to be distracted by the world? When we look only to created things to give us pleasure instead of fixing our gaze on our creator? ‘Listen, Israel: the Lord our God is the one Lord. You shall love the Lord your God with all your heart, with all your soul, with all your strength. Let these words I urge on you today be written on your heart. You shall repeat them to your children and say them over to them whether at rest in your house or walking abroad, at your lying down or at your rising; you shall fasten them on your hand as a sign and on your forehead as a circlet; you shall write them on the doorposts of your house and on your gates. A man came up to Jesus and went down on his knees before him. ‘Lord,’ he said ‘take pity on my son: he is a lunatic and in a wretched state; he is always falling into the fire or into the water. I took him to your disciples and they were unable to cure him.’ ‘Faithless and perverse generation!’ Jesus said in reply ‘How much longer must I be with you? How much longer must I put up with you? 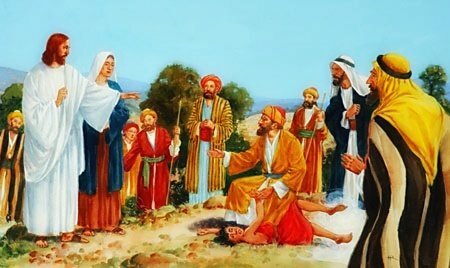 Bring him here to me.’ And when Jesus rebuked it the devil came out of the boy who was cured from that moment.